As the hype builds for Agritechnica 2017, the winners of its innovation awards have been announced. Of the 320 entrants, two gold medals were awarded, along with 29 silver innovations. Richard Bradley explores some of the highlights from the winning entrants. Designed to reduce operator input required to optimise combine setup, Claas has claimed one of the top-prizes with its Cemos Auto Threshing system. Available on 700 Series hybrid and 600 Series straw walker Lexion combines, the system automatically adjusts concave spacing to the drum and threshing drum speed to suit current harvesting conditions. Claas says this allows machine settings to be continuously adjusted without operator input to get the most out of the machine. Over the length of a day, Claas claims the system will provide higher quality and throughput than would be humanly possible. 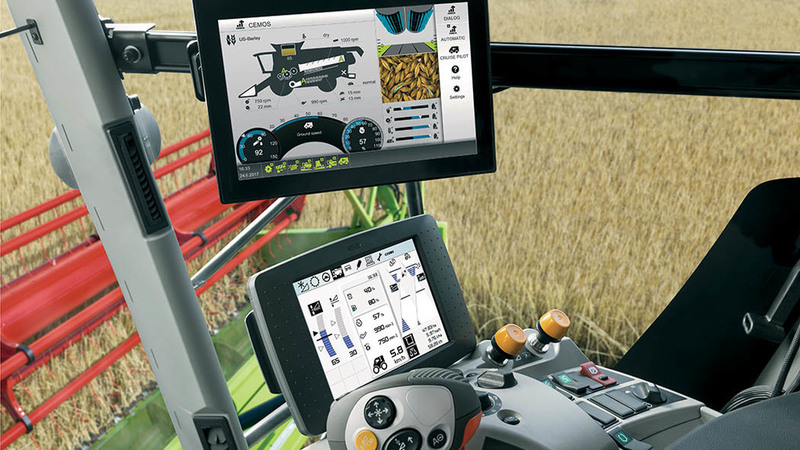 Incorporating Auto Threshing with the firm’s other automatic control systems, such as Auto-Cleaning to set sieves and fans in a similar way and Cruise Pilot to adjust forward speed, is Claas’ latest 12-inch Cemos Mobile touch screen controller. Also awarded a gold medal is Kemper’s StalkBuster header, which aims to combat the pesky corn borer in mainland Europe. 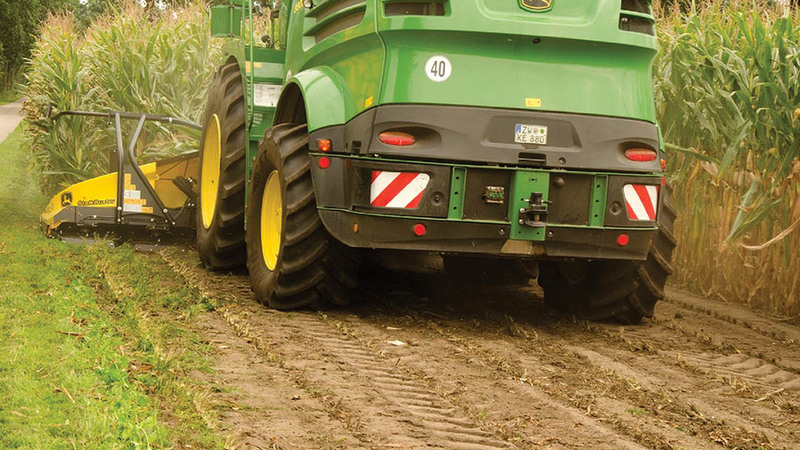 Essentially combining the firm’s standard maize header with a row of topping blades, the header will harvest the maize leaving stubble as usual, with the following blades all but scalping the ground to leave minimal stubble standing. The requirement to leave minimal stubble residue is due to the corn borer, a pest which thrives in the stubble over winter and can hamper crop quality and cob development. Kemper says up to 30 per of remaining stubble can be flattened by machinery before it is mulched or chemical is applied to combat the bug, creating a haven for the pest to grown. Kemper says its system combats this via the blade’s close-coupling, allowing stubble to be cut before any vehicle passes over it, and says the system has a low power requirement of about 4hp per maize row. Following on from pushing the boundaries of conventional tractors with its 1000-Series, Fendt has scaled down its R&D focus, this time onto a fully-electric tractor. Called the e100 Vario, this fledgling Fendt features a 650-volt lithium-ion battery with a 100kWh capacity. This whopping battery, along with an electric motor, essentially replaces the engine and all its ancillaries of a compact 200 Series Vario. Power from the motor is used to drive Fendt’s Vario transmission, and along with conventional hydraulic and pto drive, the e100 features two connections for electrically-driven implements. 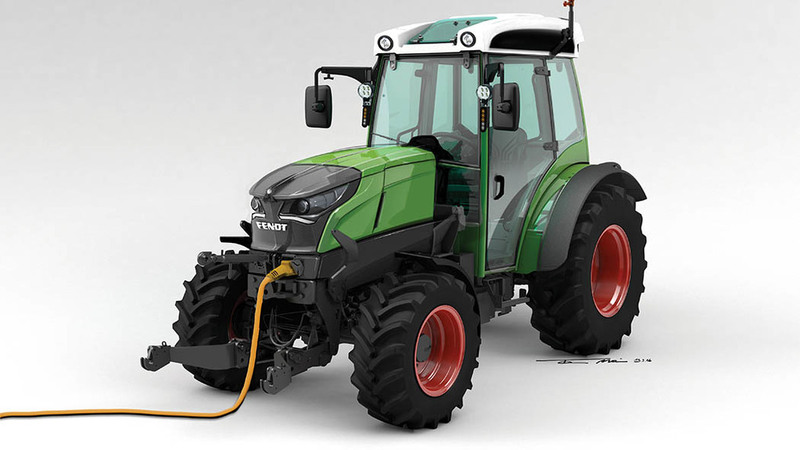 Charging can be via three-phase or a 22kW connector, and Fendt claims operating times of up to five hours are possible. 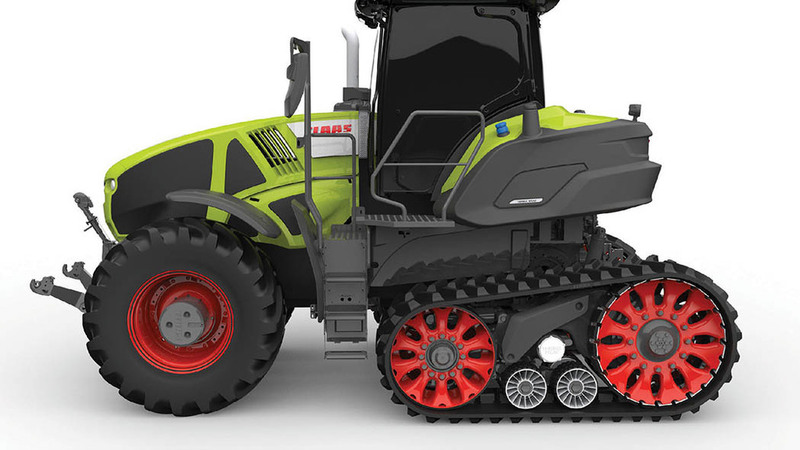 Another innovation which has been recognised from Claas is its Axion 900 Series shod on Terra Tracs. While the firm acknowledges it is not the first to launch a half-track tractor design, it reckons it is the first to launch such a machine with track units which incorporate a suspension system. Available on certain Axion 900 Series tractors, the system is based around Claas’ tried-and-tested Terra Trac units used on its Lexion combines. The manufacturer says the units provide a balance between the traction and soil protection of twin-track tractors, with the more practical driving characteristics of a conventional wheeled machine. Claas claims suspension provides a comfortable ride even when travelling at their maximum speed of 40 kph. As the size of ploughs grow, so do the Z-shaped patterns left behind when lifting out at headlands, leaving an awkward area to invert properly. 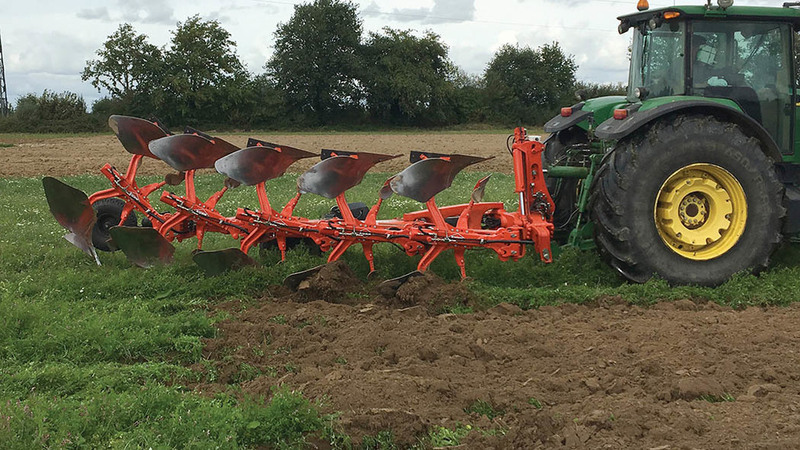 Aiming to combat this issue, Kuhn has developed a GPS-guided system which raises and lowers each plough body when you approach the headland to leave a straight edge. Called Smart Ploughing, the system works by utilising the hydraulic rams used for the plough’s auto-reset system, and should allow the operator to focus on ploughing, rather than dropping and lifting the plough at the right time. Leaving a straight headland should not only reduce the number of runs required to plough headlands, but also means virtually all trash should be buried where the headland and furrow meet, which otherwise may have been brought back to the surface. Hoping to maintain consistent seedbeds in varied conditions, Pottinger has developed a camera-controlled system for its combination drills. Previously set by the operators judgement, adjustments to forward speed and rotor speed via the tractor’s pto to alter the quality of seedbed are controlled automatically by the system. Cameras mounted in-between the power harrow and drill sections are used to monitor the soil tilth, which relays information into the system. Desired levels of tilth are set through the in-cab terminal. To suit towering maize crops, where operators could spend hours staring into seemingly endless ‘walls’ of crop, Krone has developed a vertical cab lifting system for its latest BigX self-propelled foragers. 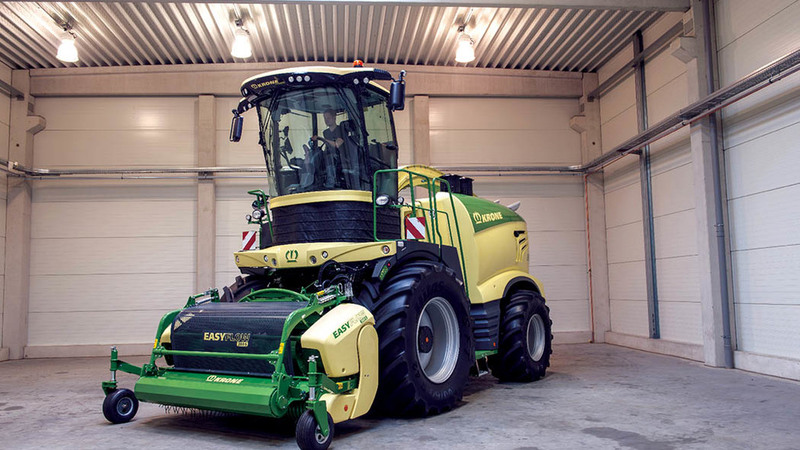 Allowing the cab to be raised by up to 70cm, the system aims to raise the operator above the crop to reduce fatigue. Krone says the system also allows the operator to better see into trailers, and provides an improved view of machinery and potential hazards around the field. Another advantage of the system, according to the firm, is the additional space created underneath the cab for servicing and maintenance, such as getting at the chopping cylinder.